The oldest meteorite ever discovered could help researchers on their quest for truth: discovering how our solar system formed 4.6 billion years ago. The record breaking space rock was discovered in Mauritania, Northwest Africa. Found in a sand dune in Mauritania, the light-colored space rock is laced with green crystals and is about the size of a baseball. Fondly nicknamed ‘Northwest Africa (NWA) 11119’, the rock is believed to be 4.565 billion years old. Scientists believe our solar system was formed 4.6 billion years ago – not too long before our newly-discovered sky pebble from above – when a gas and dust cloud collapsed due to gravity, possibly due to the final, star-ending explosion from a nearby supernova. It is believed that when the gas/dust cloud collapsed, it formed a spinning disc-shaped area with the very same sun that we know and love in the middle. 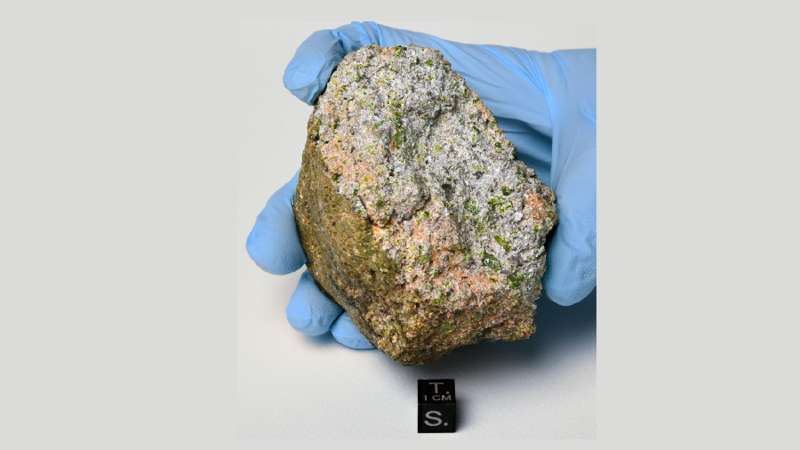 The research on this, the oldest-ever dated igneous meteorite, published Thursday in Nature Communications, provides direct evidence that chemically evolved, silica-rich crustal rocks were forming on planetesimals within the first 10 million years prior to the assembly of the terrestrial planets. The discovery could help scientists further understand the complexities of planet formation.